Yesterday, for my husband, ranks up as one of the more memorable days in his life and I was along for the ride. 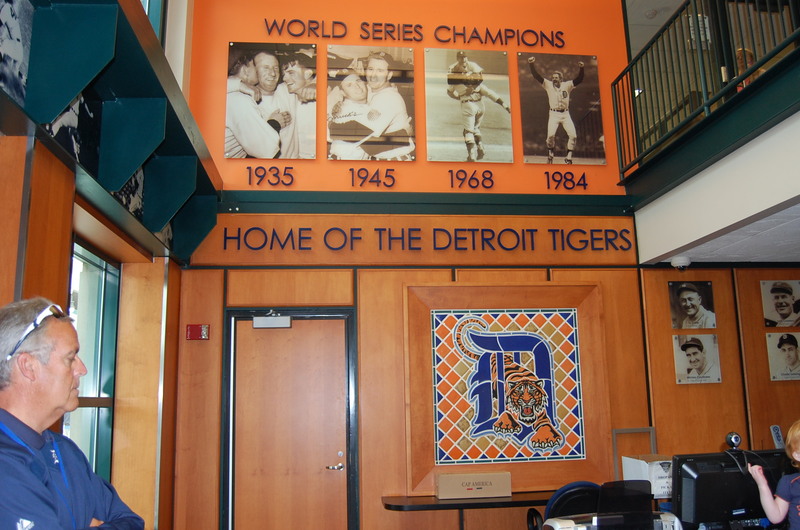 We have a small season ticket package for the Detroit Tigers and with that comes some perks. 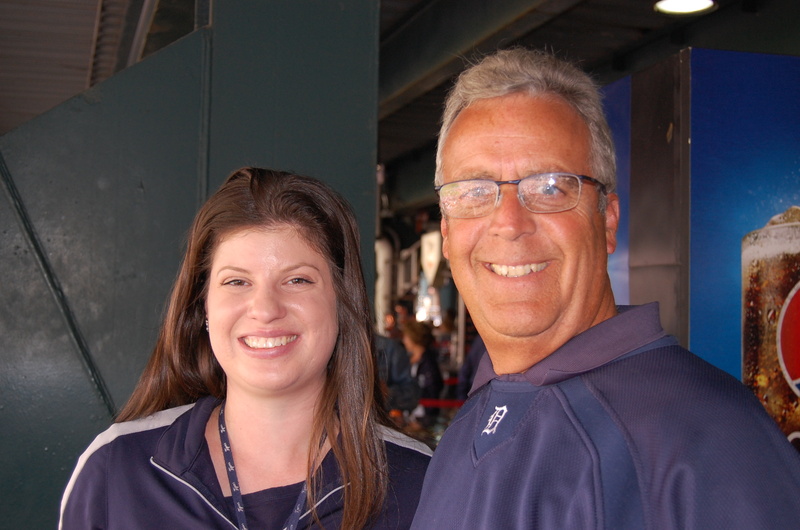 Our ticket organizer Michelle called Tom in July to see if we would like to attend a batting practice on the field. We said “of course”, and coordinated a date that worked for all of us, August 27th. 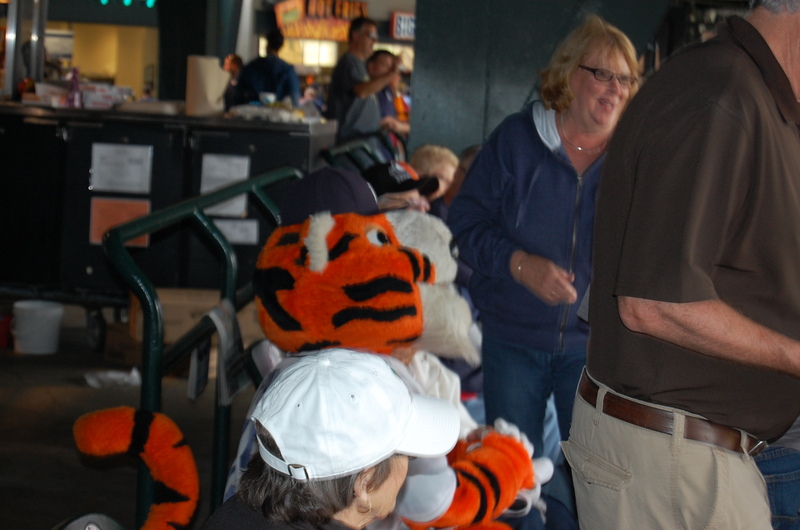 Tom had attended a game in July and snapped a picture of someone that he wanted them to autograph. 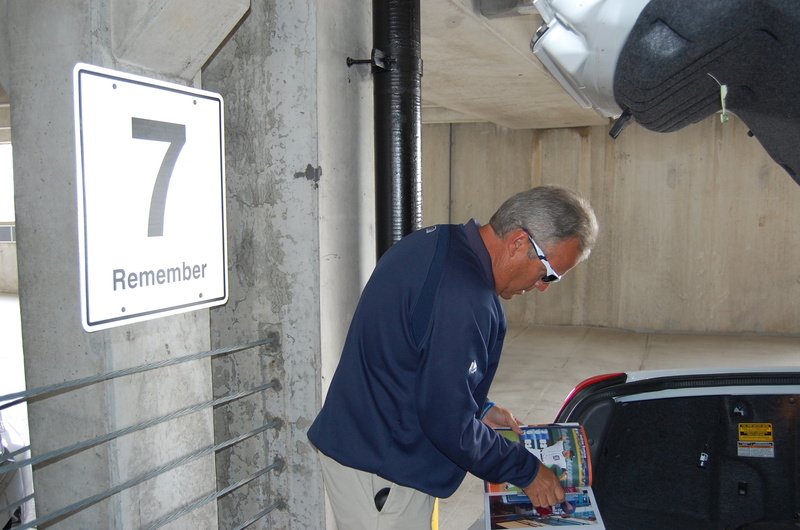 I printed it off and here is Tom, organizing his picture and book he wanted to get some autographs in. This is our parking spot in the parking garage. Would you believe I had to ask Tom what floor we were on when coming in to go home? I really paid attention didn’t I, and I even took the picture? That was about 6 hours later in my defense though. Great view from the parking garage. 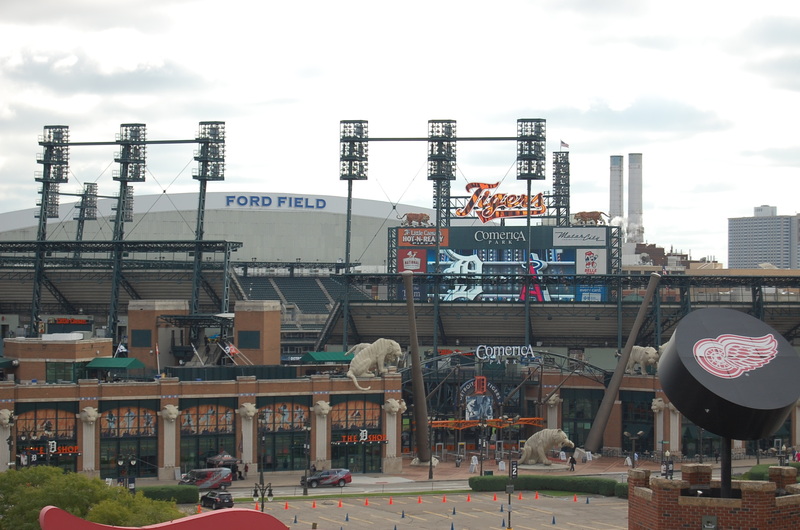 Ford Field in the background (Detroit Lions Football), Comerica Park (Tigers) in the middle and the the revolving Red Wings Hockey puck in the foreground. 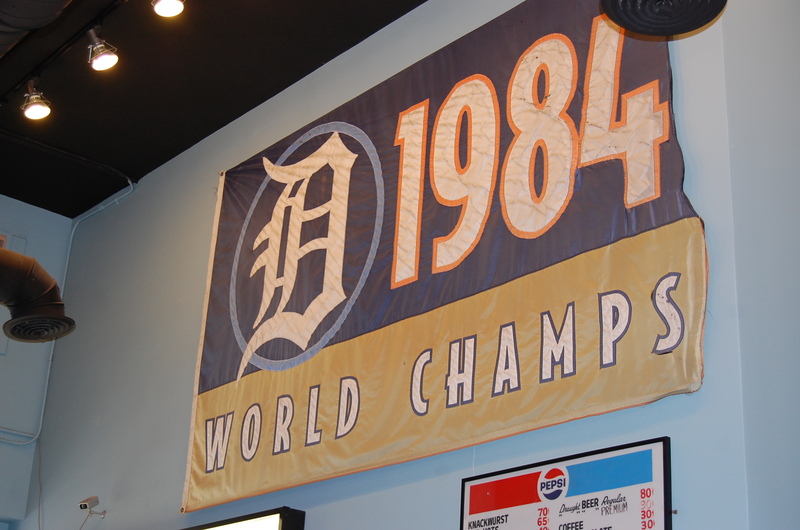 It belongs to the Hockey Town Cafe. 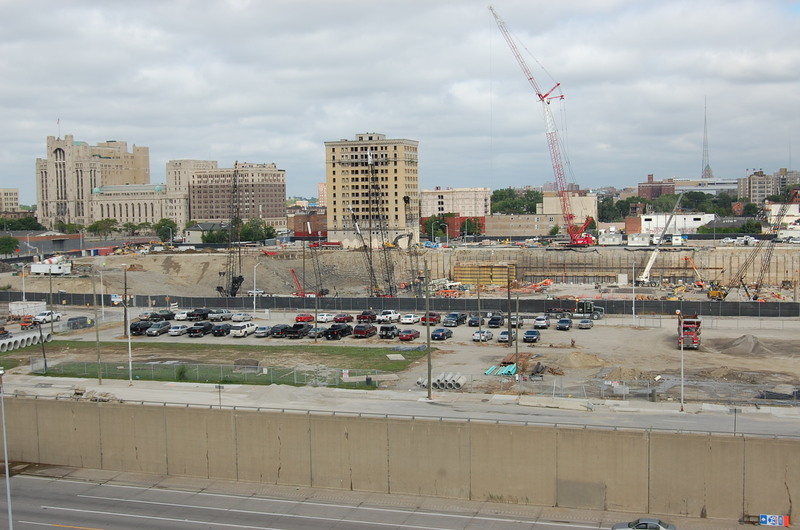 This is where the new Detroit Red Wings hockey arena is being built. 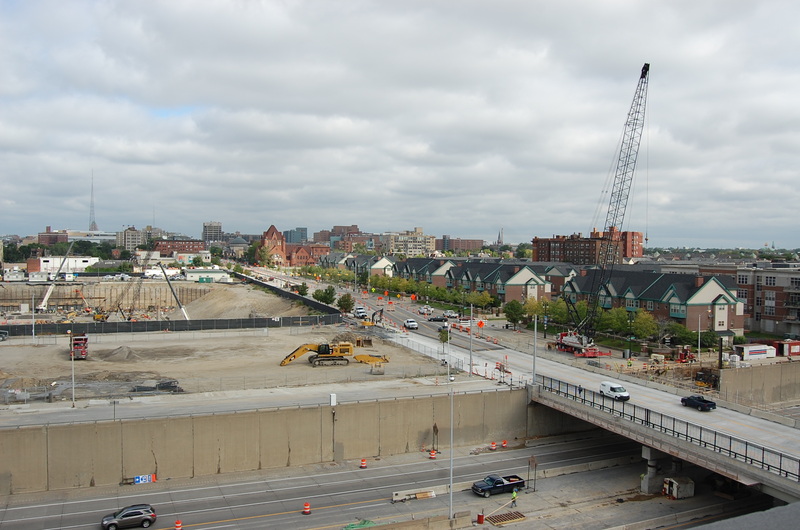 It is going to be a fabulous complex of apartments, townhouses, restaurants, shops, etc. What used to be there was a very, very blighted neighborhood. It wasn’t a safe place. One time Tom and I were waiting in traffic to get on to the interstate on a street in this area. There was a female and two males going into an old abandoned gas station. One male would come out, then the other male would go in. They had a brown bag they were drinking out of and it was just not good. We knew what was going on and it really bothered me. In 2010 we had been watching the prices of these condos. The real estate market was tanked, the prices in Detroit were really low and we saw these get down to maybe $58,000 and we really considered buying one. 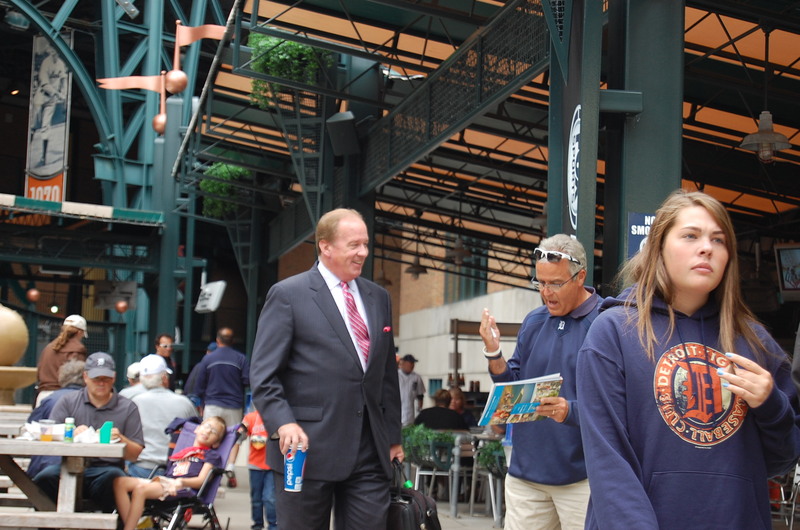 Especially since it was two blocks from Comerica Park. After witnessing the gas station incident I didn’t want to stay around that area. We could kick ourselves now! 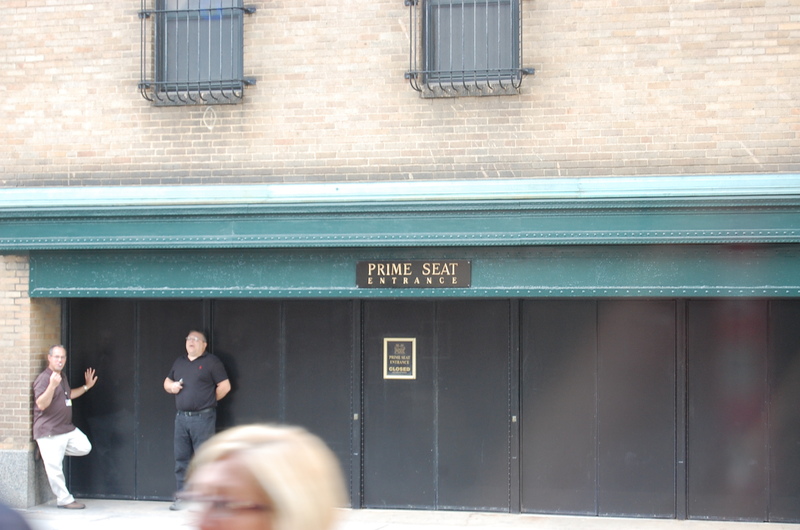 Look at the prime area they are going to be across from! We didn’t have a crystal ball…it would have come in handy though. 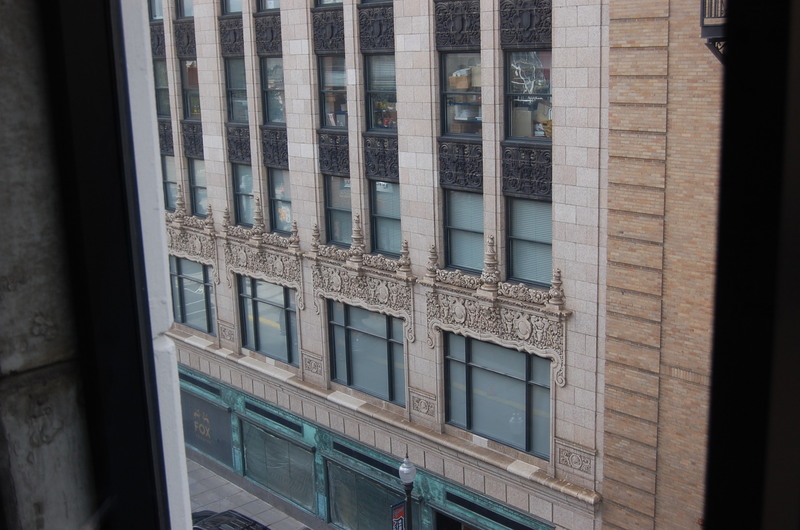 Coming down the elevator, the side of the Fox Theater building. I loved the ornate carvings. I also liked this sign. I made me wonder just how good those seats were. 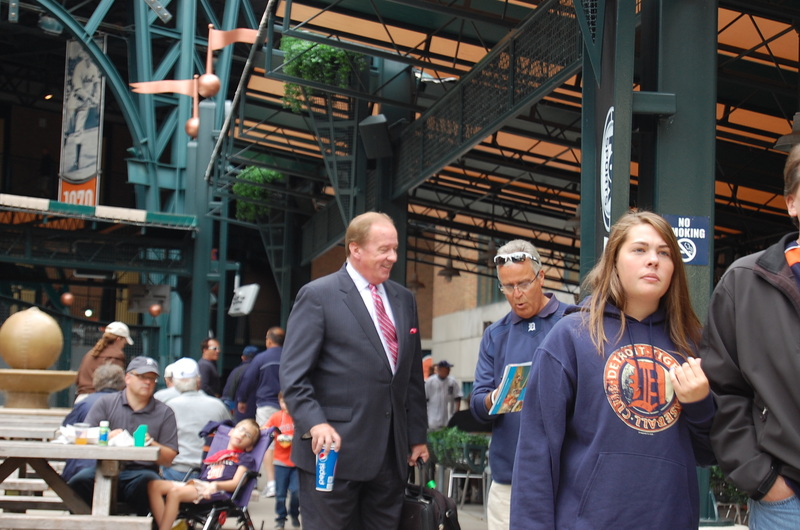 We were to be there by 10:45 so we made our way up to Comerica Park, which by the previous pictures, was just a few blocks away. 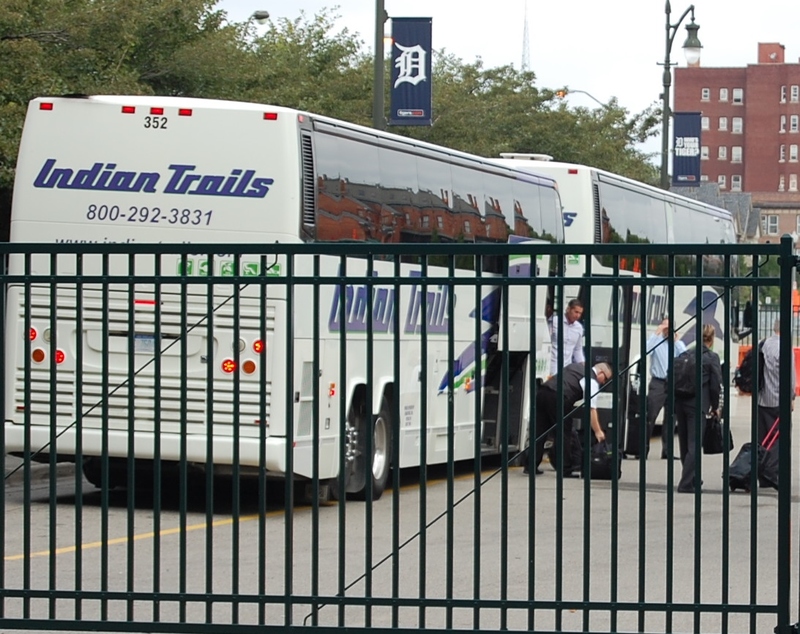 We got there in time to see one of the Los Angeles Angels bus drive in. Tom could kind of tell who they were and he thought is was the pitchers. So that was fun. 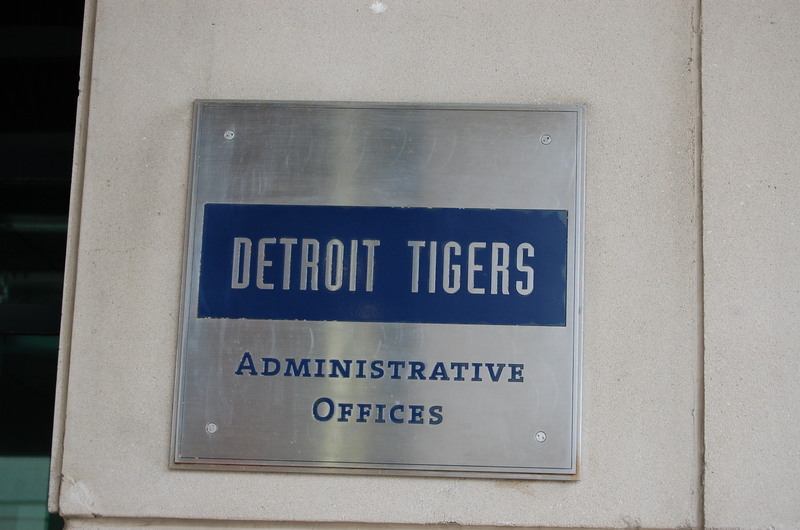 We were to check in at the Administrative Offices. Go through the metal detector and say who we were here for. We loved the pictures in the office. 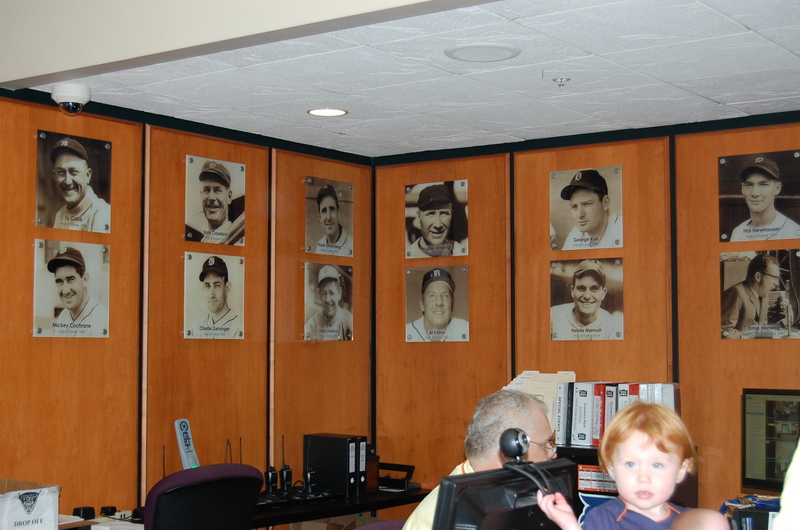 Tom was just in Heaven just being in this office. My job is to document. I am enjoying myself also, but not like my husband. It is like he is absorbing it in. 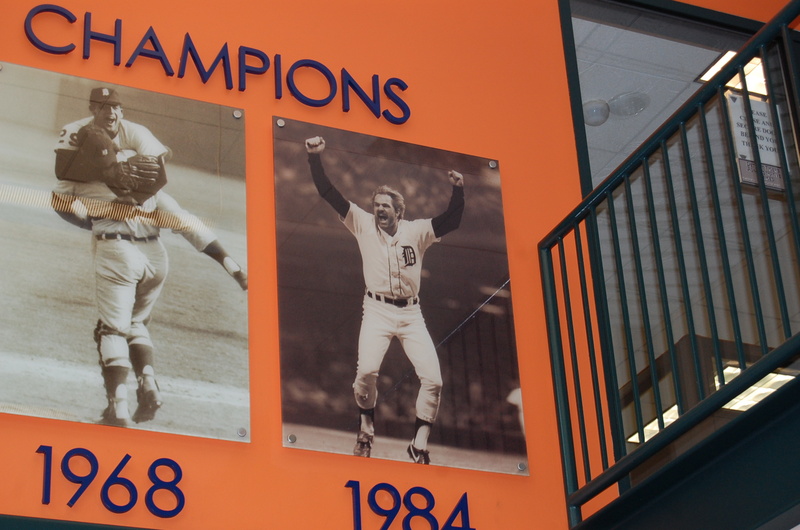 Players important in the history of the Detroit Tigers. 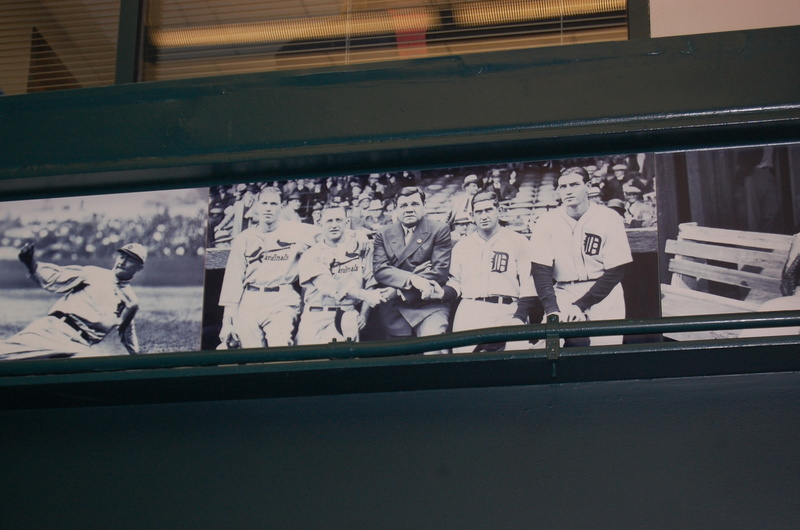 A very historical picture with Babe Ruth in the middle. 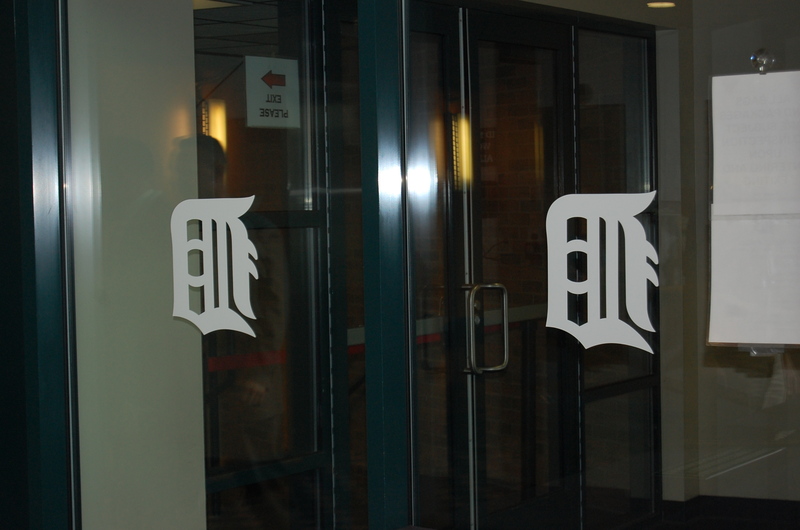 Everything has the Old English D on it. Even the hand dryers in the bathrooms. A picture of Kirk Gibson hitting a home run in the 1984 World Series. I have included the video of it...it was great off Goose Gossage. Kirk Gibson went on to hit another in 1988 playing for the Los Angeles Dodgers. 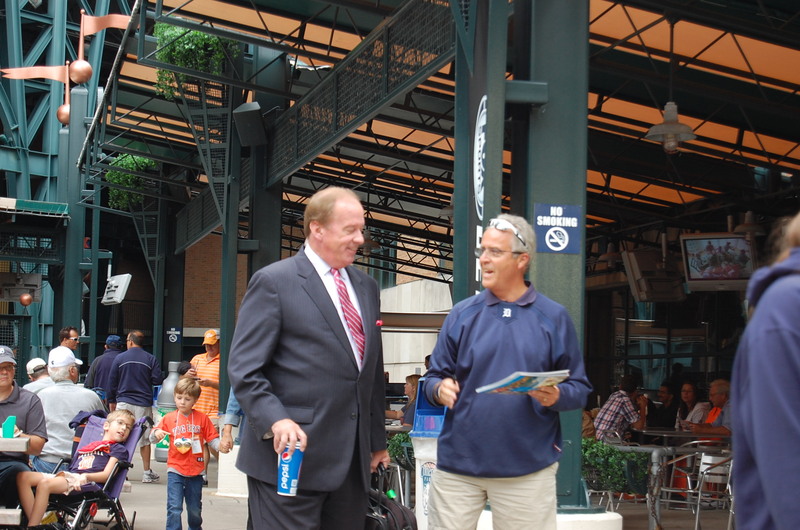 He then went on to be the manager of the Arizona Diamondbacks until recently he has come back to the Tigers and is a radio commentator. 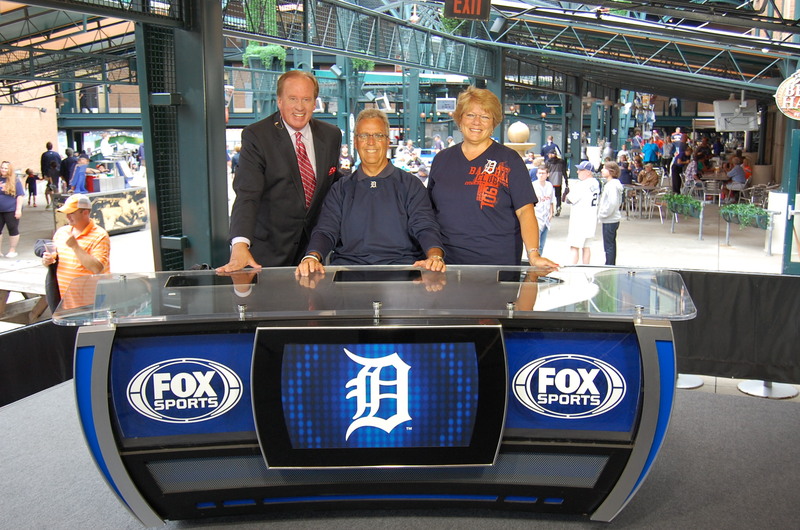 At the beginning of the season he discovered he had Parkinsons Disease. I truly believe it will not get the best of him and the disease has a good strong opponent. 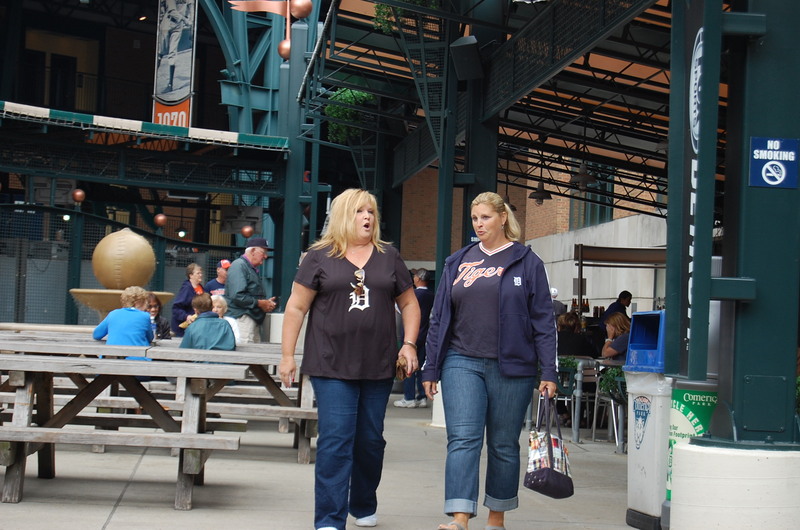 An interesting note….the Tigers Wives, this week, had an online auction, as they do every year. Kirk Gibson sent a baseball to Goose Gossage to sign and write “I should have walked him” and then Kirk also signed the baseball and it was in the auction. You really need to watch the video to understand this. I don’t know how much it sold for. This sweet little girl was keeping her grandpa busy while he was waiting for someone else in the same area. Even the carpet has old English D’s on it. So Michelle came down and said that batting practice had been cancelled. This didn’t surprise us any…that’s the way things go with us. For example: 1. When we went to Virginia we drove to Chincoteague Island to see the ponys….the road to the ponys was closed. 2. We went to Indianapolis for a weekend and the room down the hall from us caught on fire. 3. We went to Chicago and had a weekend from hell because our car kept breaking down on the freeway. 4. I went to a ballgame in Chicago and a vendor was throwing peanuts to the guy behind me and the package hit me in the side of the face. 5. Again the vacation to Virginia Beach resulted in changing hotels because our hotel was under a loud and uncomfortable renovation. So we were not surprised that this happened and we have learned through the years to prepare ourselves. 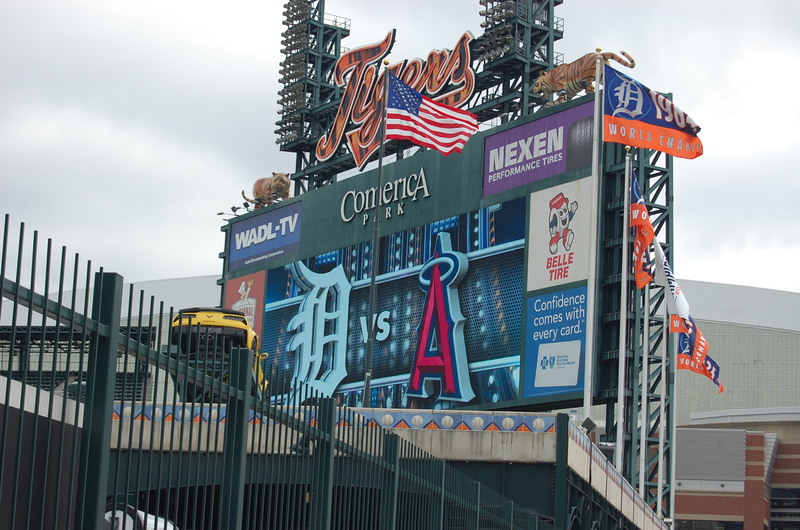 Also they had a night game the night before and Justin Verlander almost had a no hitter, so they probably whooped it up. Maybe they should have had batting practice because they lost the game 2 to 0…and the pitcher did a great job! So Michelle was so sorry and told us to reschedule and that she would get us a signed baseball and so we were happy. She said she would bring it to our seats. Believe you me….we were still just tickled to be there! We left and just started walking around because we had some time to kill. Look at this view down the street. 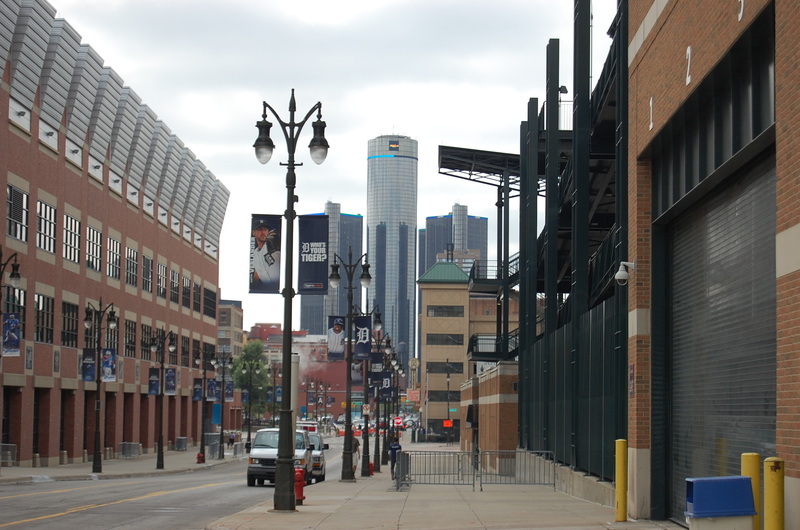 Ford Field on the left, the GM headquarters straight ahead and Comerica Park on the right. 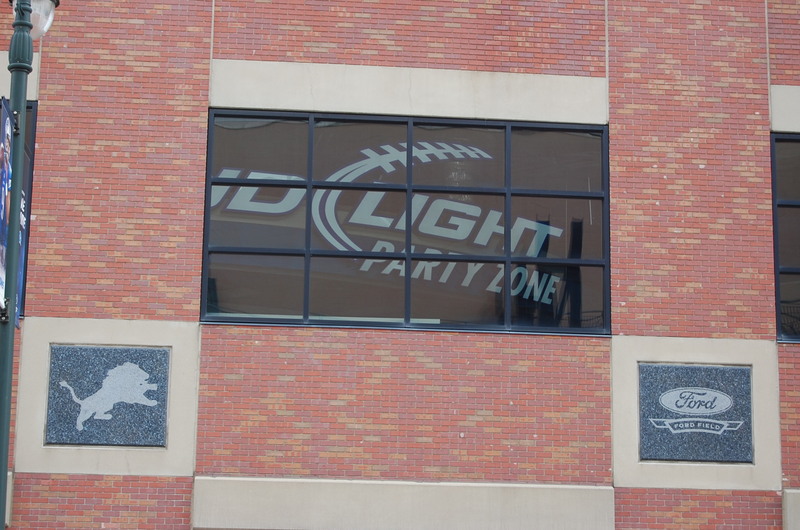 When we go to a football game, we spend time here in the Bud Light Party Zone. It’s great, they have food and drinks, and I think they are complementary. 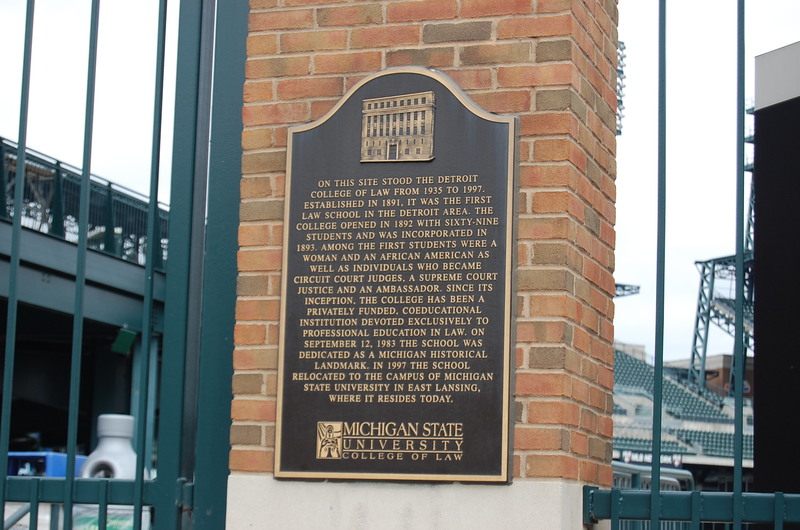 This plaque I had not noticed before on the side of Comerica Park. It was interesting. There is so much to see, I am not surprised I missed it. Just a good close up of the pregame screen. The graphics were really good because that A looks like it is popping off the screen. 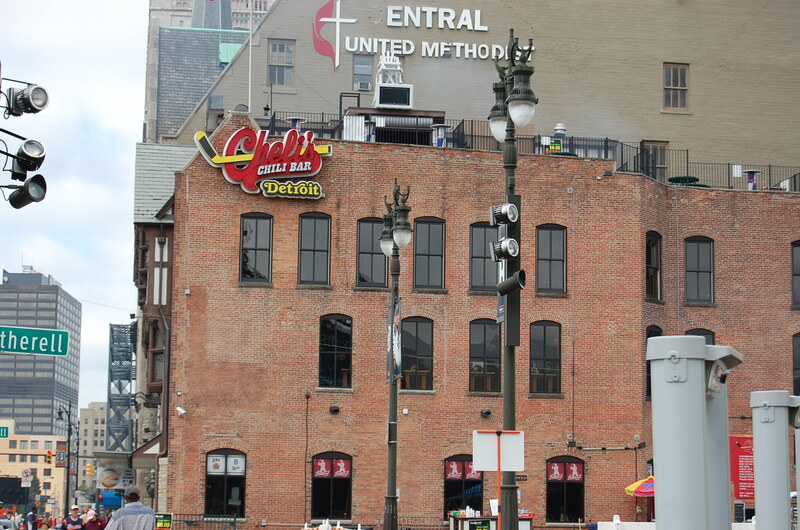 We were going to go eat at Cheli’s who is a hockey player for the Red Wings. He used to play for the Blackhawks also and I don’t know who else. 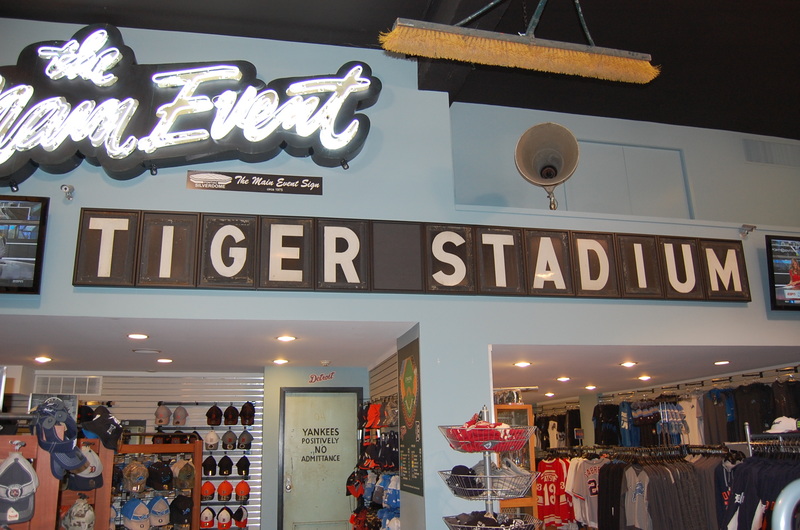 But before that next door to the restaurant is an sports apparel shop that we looked around in. 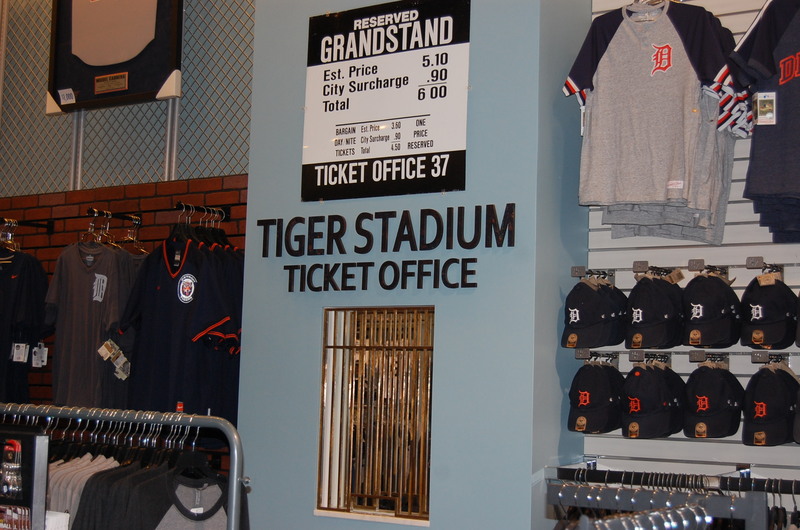 It was neat because it had actual items from old stadiums. Close up you could tell this was old and worn. Such memorabilia! Also old and worn. 20 years old. 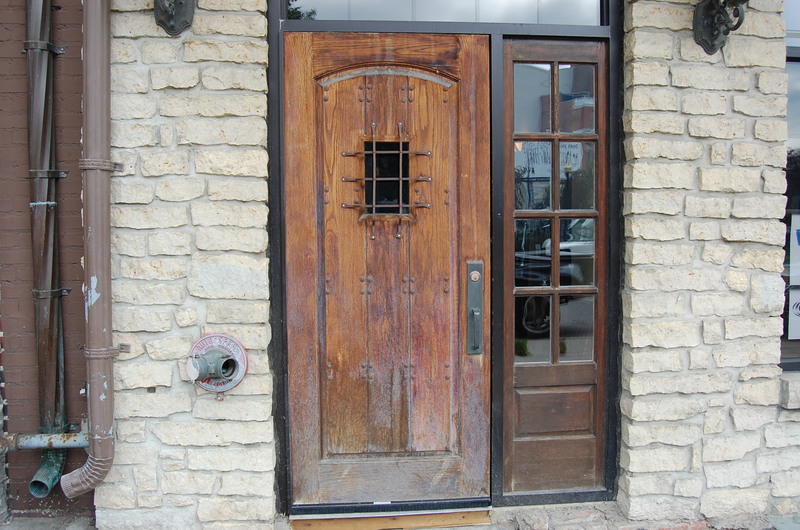 Walking back to Cheli’s…I liked this old doorway. Cheli’s then was full and the line was out the door so we moved on and went in to sit and have a drink before the stadium opened at 11:30. Doing a little people watching while we are in the stadium waiting for our autograph person. Friends have taken a day to come to the ball park. 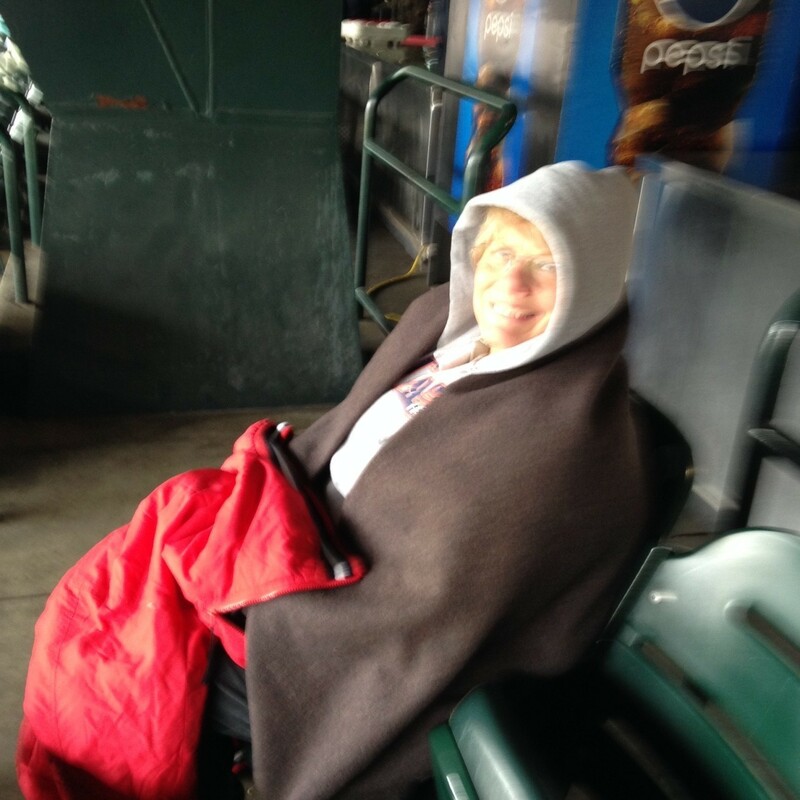 This guy is hoping to catch a fly ball or a foul ball. Tom has spotted his guy and he is showing him the picture. He is telling him about it and it’s a good sign that he is smiling. I see he is now talking with his hands and it looks like they are starting to move. John Keating says that he would be glad to sign it but “Hell, we can get you a better picture than that”. Come on up! So here we are, and look at Tom….just loving it. He is having such a great time! Here is Michelle, our ticket organizer, she has just delivered our signed ball to our seats. 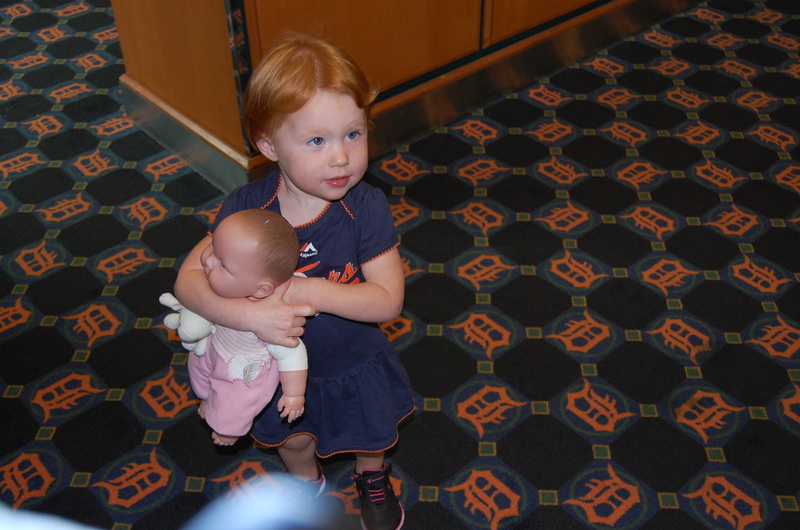 She said, I got J.D.Martinez to sign it, I thought that would be a good one. I agreed, she picked a good one. Let me tell you friends, he is on fire. 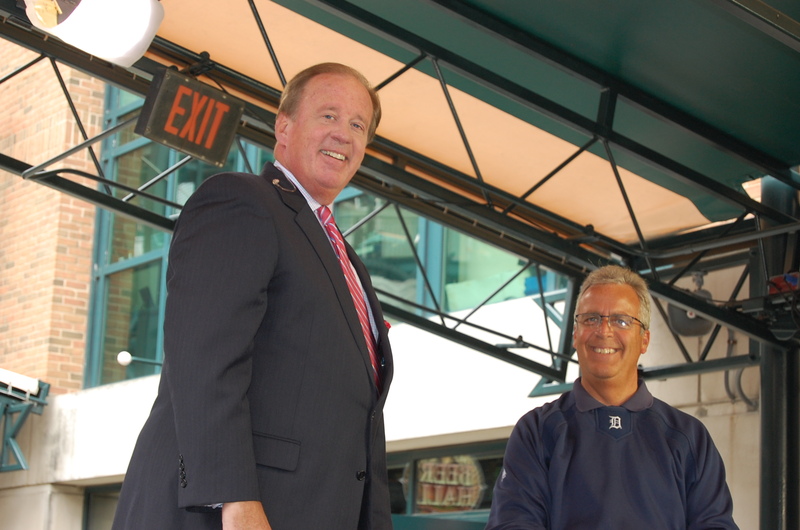 He was a great acquisition for the Tigers. The fun just keeps on coming! Our signed baseball by J.D. Martinez, No.28. He hit a triple which was great! Nobody could get him home though. To end our day at the ballpark, Paws was talking with a lovely elderly lady and giving her a t-shirt in the aisle beside our seats. It was a fun day! Thanks for sharing it with me. 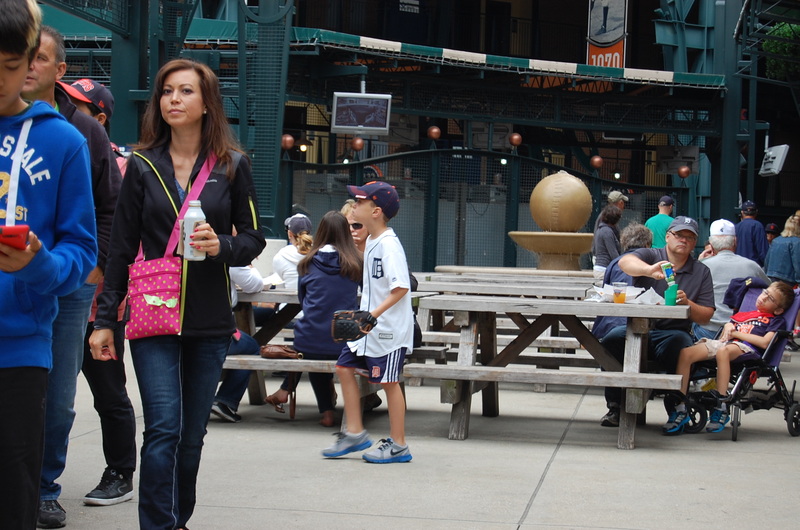 A week ago we went to Comerica Park in Detroit, one of our favorite places to go. We anticipated chilliness but the forecast did not live up to its high of 48. Now I really don’t like to be too hot or for that matter too cold. I dressed in layers, long underware, t-shirt, heavy sweatshirt. I knew I was in trouble when the thermometer kept going down instead of up. Gametime temp was 33 degrees with a wind of 10 mph. So before we left the car I grabbed this heavy jacket and the wool blanket. Here I am smiling but I think my teeth were chattering. My husbands teeth must have been chattering also because that picture is a bit blurred. I had earmuffs and gloves also. The temp got up to a balmy 36 by the end of the game. Two hours south of Detroit at home, sunny and 48. We still had a good time. It took us most of the way home with the heat up and the fan blowing to thaw out. April temps are always iffy. It was great to go to the bathroom where there was hot water to thaw out our hands. People were standing in front of the hand dryers just to warm up. It was a first to buy coffee instead of the usual ballpark beverage. Nothing like a good time at the ol’ ballpark! I would do it again in a minute!